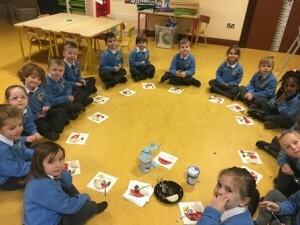 Junior Infants Room 5: I Taste with my Tongue. Room 5 has been exploring the theme of our senses. We discussed our 5 senses and then had a lesson on each sense, becoming guide dogs during PE and even creating the different noises heard in the city and the countryside. This week we explored our sense of taste by doing a tasting session as a class. We tasted the four main tastes – bitter (natural yoghurt), sour (lemon), sweet (chocolate) and salty (salted rice cakes). Can you guess which one was our favourite? We use our senses to explore the world around us. Learning about our senses allows us to appreciate our them as gifts and to come to an understanding about disability. Doing the blind walk and the taste test allowed to take part in in trust building activities. We really enjoyed learning about our senses. To check out more pictures of our taste test click here.